Colleen has been employed with the Avalon Retirement Lodge for around a year now and previous to that she worked at Tim Horton’s for 2 years. Colleen usually works the morning shifts because she is the breakfast cook. Being a breakfast cook means that Colleen is the person who makes all the meals in the morning for all the individuals. As well as cooking Colleen has to prep for her morning as well which includes cutting up all the foods she needs for the morning and as well arranging plates and cutlery where needed. (See picture of Colleen prepping her morning rush) Colleen is such a friendly person that she loves that she gets to connect with the individuals who live there as well as her co-workers. When talking to one of Colleens fellow co-workers she expressed how much they all love having Colleen there and that she is very efficient in the work that she does, she will go above and beyond to make sure the work gets done. Besides being the breakfast cook as her main job Colleen will also pick up serving shifts as extra when the opportunity is given. 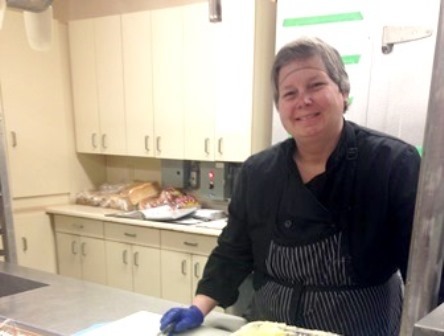 While serving Colleen gets to connect with the individuals there and as well gain other skills past the kitchen ones she has. Besides Colleen working at the Avalon she is very connected with her community. Colleen volunteers as a leader with an Orangeville Girl Guide group where she assists leaders to run activities and is very well liked by the girls and other leaders. As well Colleen is very connected with the drama production at Community Living; you can always find her in the newest upcoming play having a great time. Colleen also loves to attend friendship every other Friday with her friends. Colleen has an excellent work ethic; she works hard from the time she starts until the time her shift is over. Colleen is completely independent at work as Employment Services only checks in once a month to ensure everything is going great and see if there are any concerns. If you every go into the Avalon you will always find Colleen with the biggest smile on her face. WAY TO GO COLLEEN!! !